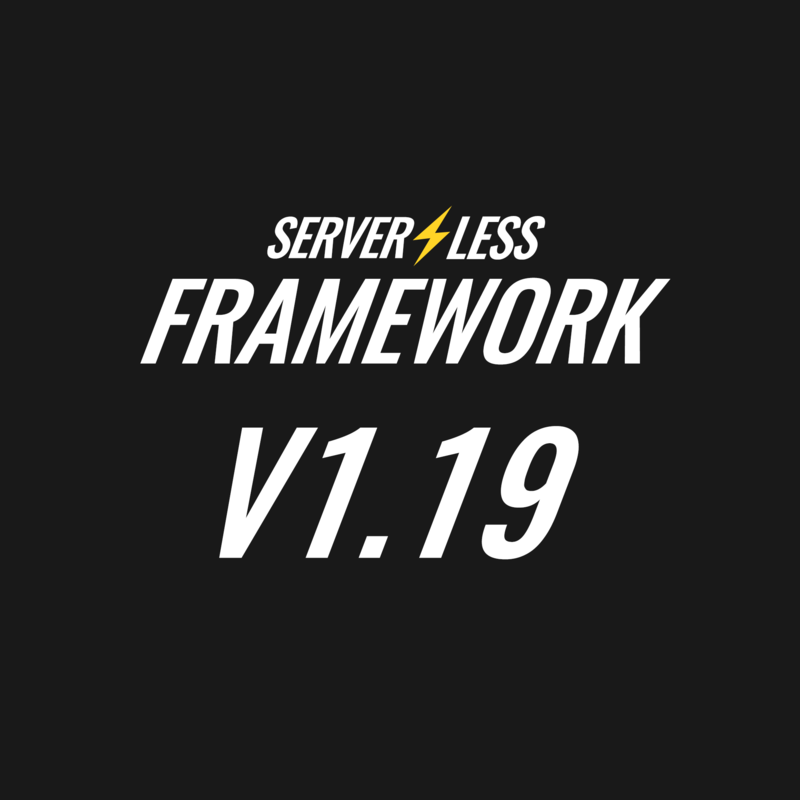 Today we're excited to announce Serverless Framework v1.19. This release mostly focuses on small enhancements and bug fixes. Big thanks to everyone in our community who reported bugs, opened issues and joined in on discussions. Thoughts or questions about the release? Feel free to provide some feedback in our Forum, via Twitter or on GitHub. The Serverless Team is currently working on some new projects we'll announce at the Emit conference in August. As a result, upcoming Serverless releases will likely focus on bug fixes and minor enhancements. But thanks to our community, we still have some cool stuff coming up. In addition to the 1.20 milestone and its Issues and PRs, we still have lots and lots of other Issues and PRs. We'd love to implement and introduce these in some of the upcoming releases. Do you want to help out and improve the Serverless Framework? Great! We've compiled a list with some of the most wished features to make it easier for you to find areas where we could most use a hand. We already started a WIP implementation with the following PR, but for now it only provides a partial solution. Do you have any ideas how we can improve the support for this feature? Services can grow significantly in size. We've worked on different solutions for this problem (see this PR) but we're still not 100% there yet. We're currently looking for a way to implement basic request validation via raw CloudFormation. The ApiGateway::Deployment resource has a random string in its name so that deployments are re-triggered on AWS end. This makes it hard to create other CloudFormation resources which dependend on it. It would be nice to skip resource delpoyments if the corresponding resource already exists (e.g. when using DynamoDB tables). Could you think of a reliable, production ready way that will detect which resources deployments could be skipped? arns are used everywhere in CloudFormation. However some of our event sources don't support all the different types of intrinsic functions which can be used to reference arns. It would be great to have a global arn parser which can be re-used throughout the whole codebase. This parser could also be exposed to the framework user e.g. via this.provider.findAllCfReferences(), so that plugin authors can benefit from this functionality as well. This list is just a gist with some of the most wished features from our community. We have lots of other issues where you could leave some feedback or jump directly into the implementation. Additionally PR reviews are also highly welcomed as they greatly speed up the time-to-merge. Emit, our conference about event-driven architectures is approaching fast: August 17th 2017 at The Pearl SF. We're going discuss the future of event-driven computing, and we want you to be there. Some tickets are still available so feel free to reach out to us if you're interested in participating. Support for request parameters when using Lambda Proxy integration and more added in the Serverless Framework v1.18 release.